The Events pane accumulates all the blocked/allowed events produced by Windows 10 Firewall Control and provides with ability to adjust the programs permissions by adding related enabling/disabling rules promptly. The pane does not display events generated by WindowsFirewall. If a program is blocked by WindowsFirewall, the related permissions adjustments have to be made with the WindowsFirewall related applets only. The events notifications are displayed in the notifications balloon as well. The balloon is a yellow window at the right bottom corner of the screen. The balloon includes all the recent events regardless of the origin. So, the balloon includes WindowsFirewall related events as well. A program may have enough permissions in Windows 10 Firewall Control, but the program may be disabled by WindowsFirewall. Tracing the balloon instant events notifications helps you to monitor the programs network behavior and diagnose the extra blocking shortly. The Events pane is accessible by clicking the balloon. All the blocked/allowed events are saved to the access.log file of the installation folder. The log files accumulates all the history of programs network behavior. The Filter field allows displaying a subset of the events selected by program name. If a typed letters set matches a program name the selected events are displayed automatically. Time - timestamp of the last events to/from the same destination. Rep - Repeat count. Multiple equal events are grouped. User - user name (Network/Cloud Edition). If the program is allowed/blocked in the name of a specific user or a service, Windows 10 Firewall Control displays name of the user. There is no way to determine allowed events ownership, so "----" is shown instead of the user name. Zone includes information of the events origin. Zone or Zone/Rule specifies what zone/rule made the final access decision. Right clicking a listed event allows composing/adding a rule to patch the program permissions correspondingly (Plus Edition). The rule can be created from the listed event precisely or the rule may be expanded by using a wider IP address/service range. The created rule is inserted into existing program zone and the entire zone draft is displayed. 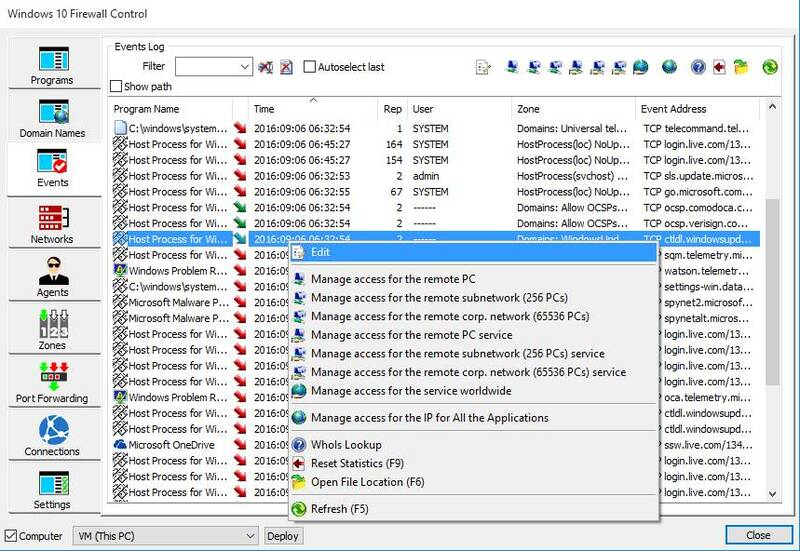 You can review and edit the entire network permissions for the program in details. If you confirm the new rules set, the new permissions will be applied for the program immediately. You can create a patching rules for all the applications at once. Please see Zone for All the Applications for the details (Plus Edition). 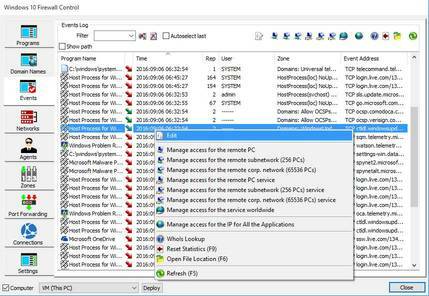 The entire program security zone can be changed from the pane directly as well. The same functionality is available with the toolbar. Whois Lookup allows you searching a publicly available independent free "Whois" database. The database informs you an IP address official ownership.